Add employees to your account with the Employees view, accessible from the Settings menu. To add an employee, click the New Employee button in the toolbar, enter the employee’s information into the form, and click the Add button. To edit an employee, click the employee’s name in the list, update the employee’s records, and click the Save button in the toolbar. De-activate an employee by removing the assigned access levels. When an employee is deactivated, she will no longer be able to access your account. Incidents written by the employee will remain in your account, but her name will not appear in the various application menus. EducatorsHandbook.com allows you to control what each employee can do when logged in by assigning her one of several roles. Before adding or editing employees, it is important to understand the roles offered by the system. Any user who can report new incidents can also view incident data for the incidents they report. District Administrator - report, edit, and delete incidents; view all incident data; approve and manage rosters; and manage all account settings. District Administrators have unfettered access to all account functions. This role should only be assigned to a small number of users. All Reports - report new incidents and view all incident data. Rosters Only - report new incidents and view incident data via approved rosters. Super Administrator - report, process, edit, and delete incidents; view all incident data; approve and manage rosters; and manage settings. For district licenses, Super Administrators can manage employee access for their campus, but not adjust other settings. This role should only be assigned to a small number of users at each school. Administrator - report and process incidents and view all incident data. Action Coordinator - report new incidents, view incident data via approved rosters, and view and track all assigned actions via the Calendar view. 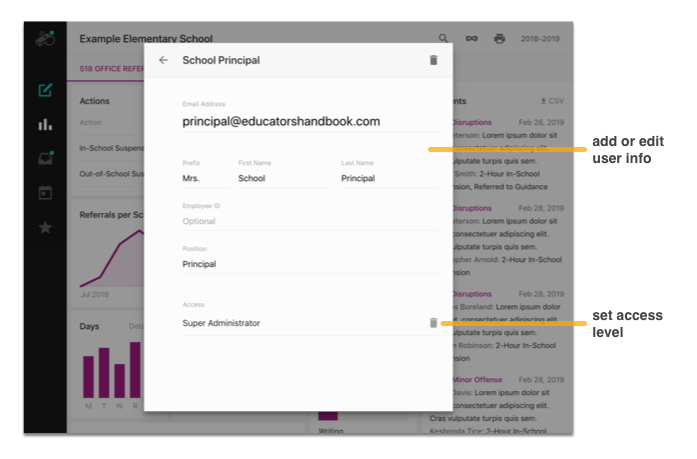 Teacher - report new incidents and view incident data via approved rosters. 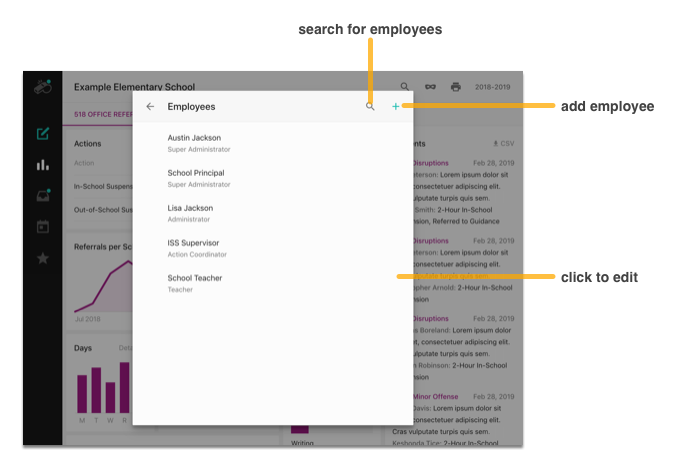 Add and edit employees with the Employees function. Manage access with simplified roles.